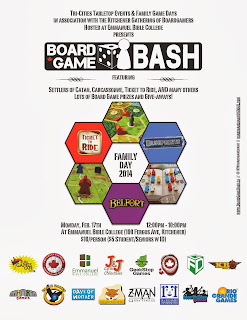 Coming up on Feb 17th, 2014 (aka "Family Day" in Ontario, Canada) the Kitchener-Waterloo region will be having its first ever board game convention. 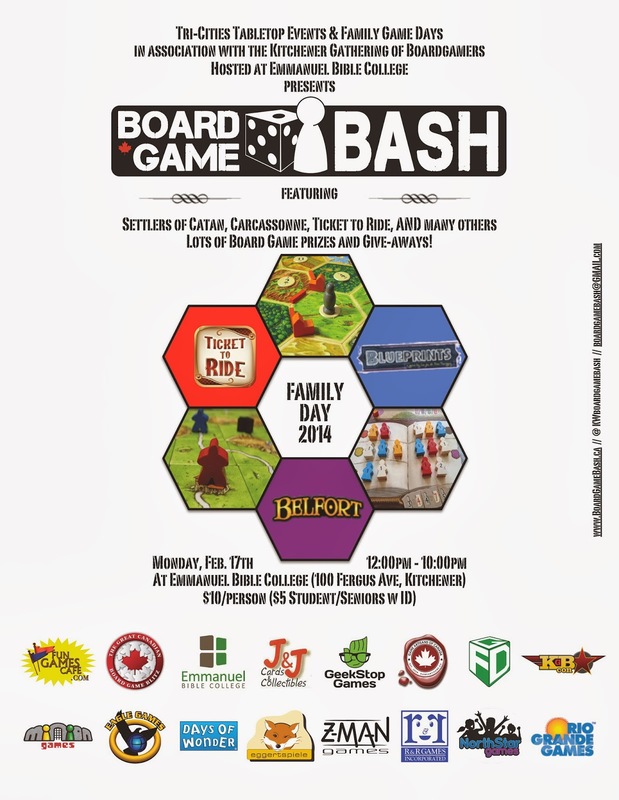 The event is called the BOARD GAME BASH. Emmanuel Bible College will be hosting the event (100 Fergus Ave., Kitchener, ON). The event will feature some fun tournaments (including a Android: Netrunner tournament at 5pm) and lots of open gaming. We will have a board game lending library free of charge to play games at the event. Also, we will be highlighting some amazing games from our sponsors with some scheduled demo's. FunGamesCafe.Com will have a retail booth setup from 12-6pm so you can purchase that amazing game you just tried in the lending library or demo. FunGamesCafe is offering free pickup for anyone who wants to purchase a specific game and pick it up at the event. Also, the BOARD GAME BASH will be giving away some amazing door prizes at different times throughout the day. And hopefully we will arrange a free math trade for the event too. Poster below. Please help spread the word. Save the picture and post it on Facebook. Print it out and post it.